How will my child benefit by attending a camp? Your child will cultivate self discipline in a completely new environment under the valuable guidance of experienced counselors, assistant counselors and supporting staff. Camp offers a wider scope for children to learn general knowledge, civic sense, brotherliness and togetherness. It works as a basic platform for your child to learn the nuances of life, and to become future leaders in society. 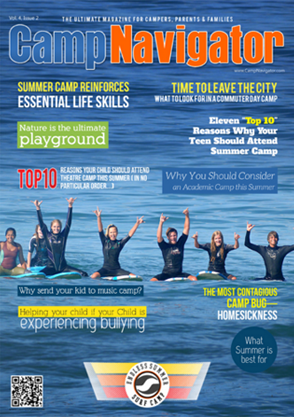 How can I be the best camp parent for my child? Your first priority shall always be to send your child to the right camp. For this, try to asses the child's interests. Is the child interested in an academic camp activity? Or does the child want to go to an adventurous camp? Get answers from your child by shooting questions in the most serene manner and come to an idea on what type of camp could be the best for him / her. This is the first step in the ladder to become the best camp parent. How do I surf the Camps listed in CampNavigator? You will find 12 main categories of camps on the left side of the Home page and click the category relating to your child's interest. A new page will open displaying several sub categories making it easier for you to select the most suitable sub-category. It will take you to a refine search page where you will find on the left side the list of camps state wise and city wise. Under it, you will also find listed camps price wise per session per week, camp types such as day camps and night camps, activities of camps such as religious or academic and different camps with their lengths such as one week camps or 8 week camps. In each section, number of available camps is given in brackets. In all the above sections, you can see all the camps in each section by pressing the link Show all in case you want to see them all at a glance. Right of the Refine Results box on the same page, you will find bigger dialogue box wherein all the individual camps are listed in the selected sub category with the total number of listed camps being displayed on top. I have found the individual camps in a sub category but where will I get the full details of each individual camp? Press the View details button on the right side of the individual camp box to see its full details including the type of camp, camp capacity, age groups, session prices, detailed description, accreditations, user reviews, direction map and contact information. Can I have preview of a camp? Yes. You can. When you move the curser on the individual camp box, links such as preview, map, get directions, request more details, share with a friend, and request call back will appear. If you want more details of the camp, click the link request more details and leave your email id and name enabling the camp director to send you more details. If you want to see a preview of the camp briefly, click the link preview. If you want the camp director to call you back, press the link request call back. Or if you want to talk to the camp director or any official of the camp, you will find the phone number there. Is there any provision for comparing two or three camps? Yes. You can compare a maximum of four camps at a time for a glance of their brief details by just clicking in their check boxes provided on the left side top of each camp. When you click, 'compare listings' dialogue box opens. Then click Compare and you can see the selected camps at a glance side by side. What is the difference between featured and non-featured camps? There is no description for this. Can I find the camps available in each state? You can find the individual camps available in each state with their details by pressing the state link concerned on the map found in the Home page. Can I find camps by category in a particular location directly? This facility is available on top of the Home page. You will find the camp category link and location fill box. Select your category and fill in your city or state and press Go. You will get what you want. If you want to use this facility, you have to fill both options. Again, just above the Map in the Home page, search options are provided for category or state wise. Is Advance Search option available? You will find this on the right side of the Home page just above the Menu tool bar. How can I select the best camp for my child? You shall have a prior assessment of various camps before selecting a particular camp by following the suggestions given in Pre Camp Evaluation. How shall I know the camp that suits my child and my budget too? Be acquainted with Camp Basics to assess the requirement of your child. Find out the fee details of different camps, subsidies, concessions and discounts given by them in various locations. Finally select the camp that suits your budget keeping in mind the concessions. How to contact a camp director directly for more information? You can directly contact a camp director by telephone by noting down the phone number found in the director's listing. Can I seek more information from a Camp Director? Yes. You can request a Camp Director to send more details by filling up the Request More Details form in a Camp listing. Can I ask any Camp Director to contact me in the process of selecting the camp for my child? Yes. You can request a Camp Director to contact you on phone or through email by filling up the Request Call Back form in a Camp listing. How to make the camp of my child highly successful? By planning your trip well in advance and equipping the child with all prerequisites of the selected camp, you can keep your child cheerful through out the camp. For some excellent tips on this count, visit the links Plan Your Camp, Night Camp Preparation and Tips for Outdoor Camping. How will I get the quality camp gear and other necessities for the forthcoming camp of my child? You can browse through the listed camp vendors and select the one nearest to your place of residence / town / city. Found two / three types of camp vendors in the listings. Which one shall I go for?